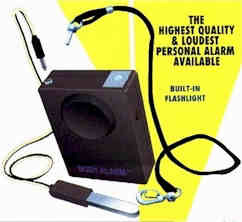 If you're bothered or feel threatened just pull the pin and an extremely loud 130 dB alarm is sounded. The sound is a weapon in itself. This alarm may cost a little more than other alarms you may have seen on the Internet, but there's a reason for that. Quality!! Alarm is made of stronger ABS plastic; instead of snapping on, the backing for battery access is held on with screws for a strong hold; built in flashlight; metal plug in pins, etc. Clips on belt/shoulder bag. Comes with Door Alarm accessory, that converts Personal Alarm into a door or window alarm. Portable, easily attaches to hotel doors. Built in flashlight with reflector lens for added safety. Powered by 9V battery not included. (see larger pic) Black only.